Northeast State commemorates Disability Awareness Week Oct. 28-31 focusing on individuals who have battled and triumphed over disabilities. The Northeast State Center for Students with Disabilities is sponsoring a week-long series of events where students and guests will discuss how they overcame challenges associated with their disabilities. The week’s keynote speaker is Carson Waugh, a Northeast State alumnus and entrepreneur, who will share his story on Wednesday, Oct. 30 at 10:30 a.m. and 1:30 p.m. in the Auditorium (A202) of the Student Service Building on the main campus at Blountville. A student panel discussion entitled, “In Our Shoes” brings together Northeast State students and faculty to discuss their own challenges with the disabilities that changed their lives and how they learned to manage them. This event begins at noon on Tuesday, Oct. 29 in the Auditorium. Monday, Oct. 28 features a screening of the film “The Blind Side” at 11 a.m. and “A Beautiful Mind” at 1:30 p.m. “The Blind Side” tells the story of NFL player Michael Oher while “A Beautiful Mind” chronicles the life of Nobel Prize winner John Nash. 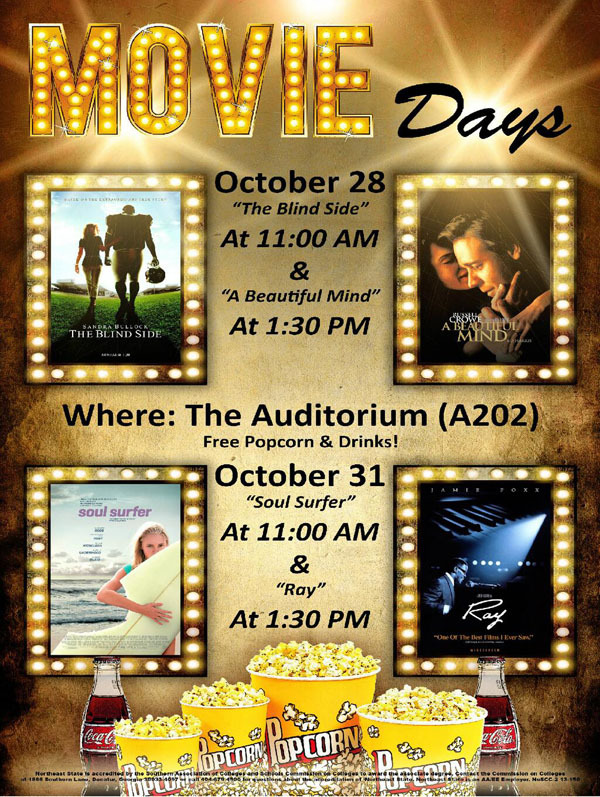 The week closes on Thursday, Oct. 31 with the showings of the films “Soul Surfer” (at 11 am.) about surfer Bethany Hamilton, and “Ray” (at 1:30 p.m.) recounting the life of the legendary Ray Charles. All films will be screened in the Auditorium and include free popcorn and drinks. Informational displays about disability services at Northeast State are available at all the College’s teaching sites. For more information, call 423.279.7640. Tennessee Gov. Bill Haslam today announced a workforce development grant of $843,000 for Northeast State to enhance Advanced Technologies programs. The governor proposed, and the General Assembly approved, $16.5 million in this year’s budget for equipment and technology related to workforce development programs at Tennessee colleges of applied technology and community colleges. The funding is part of Haslam’s “Drive to 55” effort to increase the number of Tennesseans with post-secondary credentials. “Northeast State is truly grateful to receive supplemental funding that will support economic and workforce development. These funds will be key in providing state of the art equipment for our new Emerging Technologies Complex to be completed in 2016,” said Northeast State President Janice Gilliam. These strategic investments resulted from the governor meeting with businesses and education officials across the state last fall to better understand workforce development needs. One of the most common themes he heard was the lack of capacity and equipment at Tennessee colleges of applied technology and community colleges to meet job demand, so these grants are aimed at addressing those gaps. Gov. 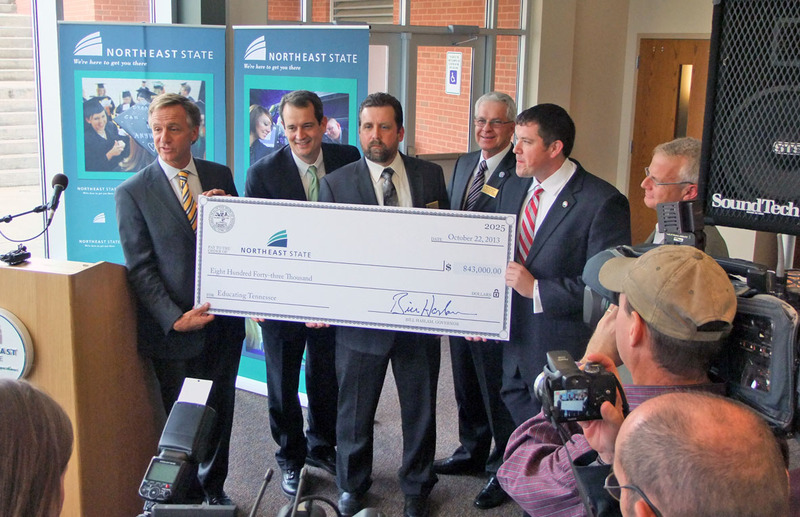 Bill Haslam today announced a workforce development grant of $843,000 for Northeast State Community College to enhance Advanced Technologies programs. Currently, only 32 percent of Tennesseans have certificates or degrees beyond high school, and studies show that by 2025 that number must be 55 percent to meet workforce demands. Haslam’s Drive to 55 initiative is designed to address that workforce need on several fronts, including the funds for the state’s colleges of applied technology and community colleges. “The equipment that will be made available through the workforce development grant will serve to further provide Northeast State students the capability and confidence to successfully enter Advanced Technologies related careers,” said Northeast State Vice President of Economic and Workforce Development Jeff McCord. The grant will allow Northeast State to obtain state-of-the-art equipment that will provide students the opportunity to learn new skills consistent with the technology used in industry. The equipment will be an integral part of the College’s new $35 million emerging technologies complex, which is currently in the design phase. According to Sam Rowell, dean of Advanced Technologies, Northeast State will acquire 10 robot training stations and a mechatronic training station. In addition, the College will upgrade surface grinders, prototype machines, and a cylindrical grinder, as well as replace a current metal shear. The addition of this equipment creates an integrated training program that will impact about 200 students, who will be prepared for using similar equipment and systems utilized by some of the area’s largest employers. “Today’s announcement serves as an example of how cooperation and partnerships among public and industry leaders provide an exciting future for our students, and as a result, a strong foundation for economic vitality,” said Northeast State Foundation President and Triad Packaging President Lee Shillito. 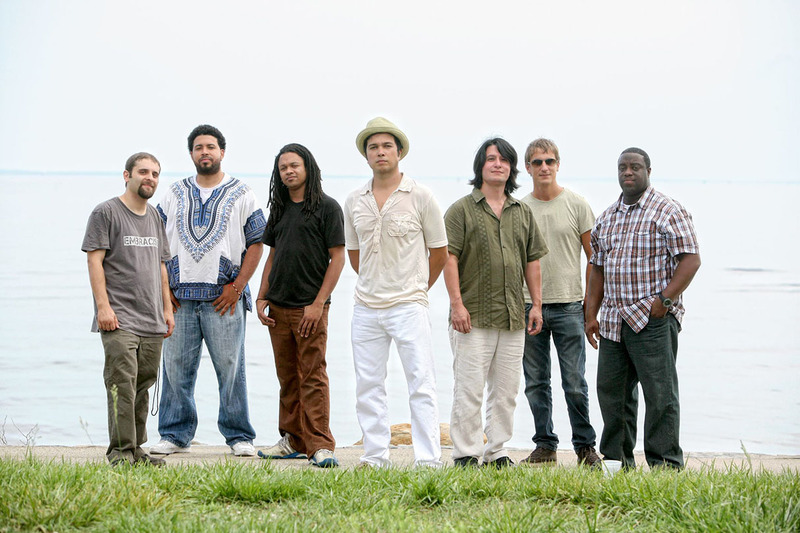 Northeast State welcomes the phenomenal Latin fusion group Cosmic Jibaros on Oct. 24 at 7 p.m. They will be performing a free concert in the Wellmont Regional Center for the Performing Arts, located on the College’s main campus in Blountville, adjacent to the Tri-Cities Regional Airport. Cosmic Jibaros have effectively changed the idea of the typical Latin rock band. The band builds its sound from Latin and Caribbean rhythms, Rock & Roll guitars and World Music influences for a sound that’s both cross-cultural and highly danceable. There’s an irresistible pull of traditional Afro-Caribbean beats, interplaying between the congas and timbales, and mixed with urban elements in the deep drum and bass and effects-laden guitar work. These songs are laced with social and political overtones, and are sung primarily in Spanish by charismatic front man Ricardo Reyes. The name “Cosmic Jibaros” reflects the blending flavors of the music they make. In Puerto Rico, los jibaros would be something akin to the American ‘hillbillies’ or ‘mountain men’- historically known for a more simple and honest connection to the earth and the hard work of living, and with musical tradition to reflect that. The ‘cosmic’ part warns of a modern twist on the old traditions, taking cues from a cross-section of World Music and creating an original, Latin progressive sound. The Cosmic Jibaros reflect that and their first album, Yo Soy Del Mundo (I Am of The World) tells that story. The event is sponsored by the Northeast State Cultural Activities Committee. For information contact 423.279.7669 or jpkelly@northeaststate.edu. Northeast State students chart the course on their academic road map Wednesday, October 23 at College Transfer Day. Representatives from a variety of colleges and universities will be available to answer questions about transfer opportunities, entrance requirements, course equivalencies, articulation, financial aid, scholarships, housing and much more! College representatives will be available for students from 10 a.m. to 1 p.m. in the Humanities Building (1st floor) at the main campus, 2425 Highway 75, adjacent to Tri-Cities Regional Airport. No appointment is necessary and there is no charge to attend the event. Representatives from the following institutions are scheduled to attend: Austin Peay State University, Carson-Newman University, East Tennessee State University, Hiwasse College, King University, Lee University, Lincoln Memorial University, Lipscomb University, Maryville College, Middle Tennessee State University, Milligan College, Southeast Culinary & Hospitality College, Tennessee Tech University, Tennessee Wesleyan College, Tusculum College, University of Tennessee at Knoxville, University of Tennessee (Kingsport Higher Education Center), Virginia Intermont College, University of Virginia at Wise, and Warren-Wilson College. Northeast State’s university parallel associate of arts/associate of science degree programs are designed for students who intend to complete the first two years of a baccalaureate degree program at Northeast State and then transfer to a four-year college or university to complete the bachelor’s degree. Northeast State has developed course-by-course equivalency tables and articulation agreements with many four-year colleges and universities. 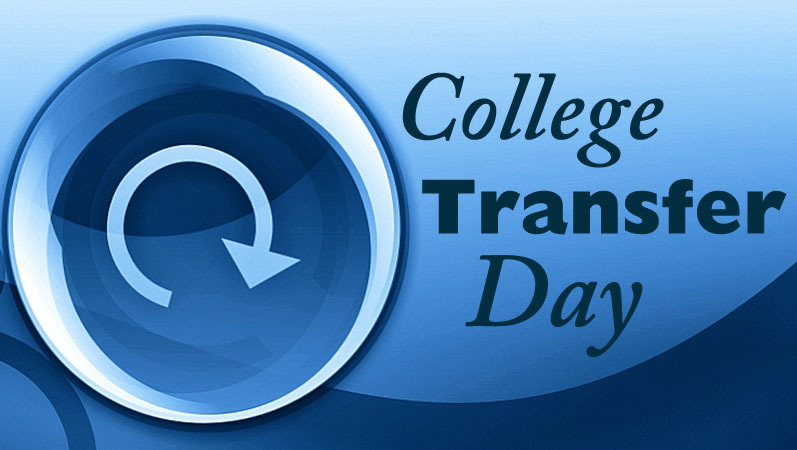 For more information about College Transfer Day, contact TRiO Student Support Services at 423.354.2540 or visit http://www.northeaststate.edu. Northeast State Community College will host its third annual Fall Technology Career Fair on Thursday, Oct. 24, 2013 from 1 p.m. to 4 p.m. at the Regional Center for Advanced Manufacturing (RCAM) in Kingsport, 305 W. Main St. The free and public event will provide opportunities to learn about job openings in advanced manufacturing and talk with area employers. The Fall Technology Career Fair returns to RCAM Oct. 24. Employers invited to the career fair represent a wide variety of companies from around the region, including those manufacturers of automotive parts, chemicals, and paper, as well as companies involved in information technology and utilities. Oxendine said she expects more than 20 companies to be on hand for the event. In addition, there will be information about Northeast State programs, and virtual welding and robotics demonstrations. Oxendine said job seekers are advised to bring along resume copies and dress appropriately. She said persons needing help with resumes or interviewing techniques in advance of the event should contact Northeast State’s Career Development Services Center to set up an appointment. The center is located at 222 W. Main St. in downtown Kingsport.